You can ask for a free pick up from the WHW. The shower block is new, really confortable. Great atmosphere at the bistro. Really clean and extremely helpful staff. Bistro was really well set up and presented well. Really good beer selection. Pick up at the hotel was much appreciated. The building has been converted very sympathically. The bar had an excellent beer selection. Excellent packed lunch. This is the best bunkhouse, showers and kitchen were fantastic, beds were really comfortable and the food was great. The staff made us feel very welcome and to top it all they have a hot tub and after a long day walking it was a god send. Don’t miss this perfect stop when walking the whw we loved it. Lovely staff and well appreciated pick up service! The food was amazing. The chef even brought our food out. The staff were so friendly and the food was amazing . A great place to camp here, nice view and nice staff. The reception and restaurant is beautiful. Originally a 19th century church, the Inversnaid Bunkhouse offers a restaurant and a bar, along with an outdoor hot tub and stained glass windows. Situated in the Trossachs, this hostel is on the eastern shore of Loch Lomond. WiFi is available throughout. The Inversnaid Bunkhouse offers various accommodation types. 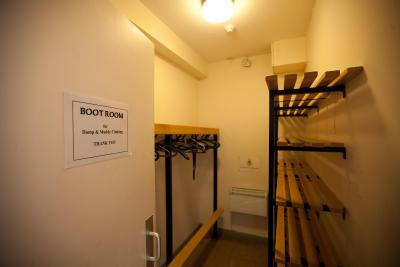 The choice ranges from private rooms, to single beds in dormitory rooms. Premium double rooms are also available. Each room has access to shared shower facilities. In the mornings, guests can enjoy a buffet breakfast and packed lunch is available upon request. The Top Bunk Bistro serves home cooked traditional favourites. The bar serves a wide selection of drinks, including bottled ales and whiskey. In the heart of the Loch Lomond and Trossachs National Park, the Inversnaid Bunkhouse is just 900 yards from the West Highland Way. With a laundry room and a boot drying room, the property is ideally located for scenic walks. Inversnaid Bunkhouse has been welcoming Booking.com guests since 17 Jul 2013. When would you like to stay at Inversnaid Bunkhouse? This private room has access to shared shower facilities. This is a bed in a dormitory room, with access to shared shower facilities. With views of the river, this room is situated within a log cabin. It has access to a shared bathroom. House rules Inversnaid Bunkhouse takes special requests - add in the next step! Inversnaid Bunkhouse accepts these cards and reserves the right to temporarily hold an amount prior to arrival. We felt that the food was pre-prepared and reheated or microwaved. Shared bathroom was a bit cold and dark. Staff lovely and new shower facilities great. Marcus was very helpful and accomodating, even though Trip Advisor had let me book when they were closed for the season. This was a very disappointing stay. I stayed here before back in 2016 which was ok but this was an entirely different experience. At first when I called I was told there was no availablity, however when I looked on booking.com I saw spaces for the same place so book it online. When I challenged the staff there was no explaination as to why I was told on the phone they were full. Another complaint was that the wifi did not work. The main thing i was upset about was the interrupted sleep at 2am when two walkers doing the WHW barged in. The american chap in the same room as me was not happy either. I find it totally unacceptable that this hostel allows people to arrive at 2am and allows them to enter rooms when people are trying to sleep. Furthermore at £25pppn that is a rip off for such a basic bunkhouse. I didnt like anything. See below. There are not enough toilets for the amount of people in the hostel. Also, the room I was in was for 4 people but it was way too small, it was like I was sleeping with the person in the other bunkbed, we had to put our towels to gain a little bit of privacy, it was really really small. We could not fit our luggage fine and it was extremely warm in the middle of the night even though the heat was off. I have been to much better hostels for the same price. The restaurant/bar was good and the drying room is really useful. The bed sheets were not changed, found a nail clipping on my bed. Tiny rooms with sometime no view. Dining area was sticky and everything dirty. Hot tub had no been cleaned for months and was vile. No welcoming from host or any interest in us or our stay. Loud music and dancing until 11.00 when most of us were up early next day to hike.